EDITOR’S NOTE: Just when you thought AdSurfDaily-related events could not get any stranger . . . Jailed near Seattle and awaiting trial in September on charges he filed false liens against at least five public officials involved in the AdSurfDaily Ponzi case, purported “sovereign citizen” Kenneth Wayne Leaming has sued “Barrack Hussein Obama” and U.S. Attorney General Eric Holder in federal court in the Western District of Washington. It is believed that “J. Doe” refers to U.S. Attorney Jenny A. Durkan of the Western District of Washington. Durkan’s office has been involved in the prosecution of a number of purported “sovereign citizens,” including David Russell Myrland. Myrland was convicted last year on charges of threatening the mayor and officials of the Seattle suburb of Kirkland. After his conviction, Myrland sued federal prosecutors in Washington state, apparently alleging a grammar conspiracy. It further follows, according to the complaint, that the charges against Leaming and Stephenson brought by the U.S. Attorney for the Western District of Washington should be declared “VOID For FRAUD” because the U.S. Attorney also is “personating” [sic] a federal officer. 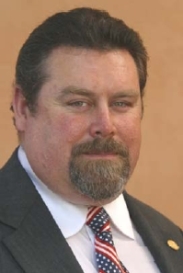 Investigators discovered a paperwork trail that linked Leaming and Stephenson to a purported $10 million lien against Harley Lappin, the former director of the Federal Bureau of Prisons, and a purported lien for $20 million against Dennis R. Smith, the warden of the Federal Correctional Institution in Phoenix. As the probe that led to Leaming’s arrest proceeded, agents found bogus liens filed in Pierce County, Wash., against other public officials, including at least five officials involved in the ASD Ponzi case. Liens against Mary Peters, the former U.S. Secretary of Transportation, and Cutler Dawson, president and CEO of Navy Federal Credit Union, also were discovered. Screen shot: From the Stephenson/Leaming complaint. 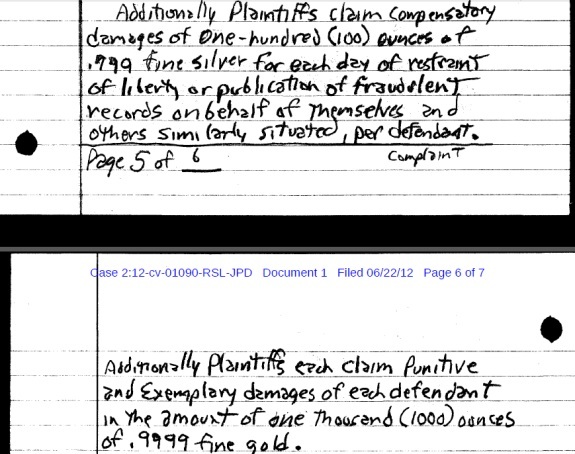 With two defendants formally named and 10 “Does,” it appears as if Leaming and Stephenson are demanding 12,000 ounces of gold. Gold is trading at roughly $1,600 an ounce, meaning the duo is asking for about $19.2 million at today’s approximate rate. Leaming was arrested in November 2011, after an investigation by an FBI Terrorism Task Force. Stephenson — already a federal prisoner at the time of Leaming’s arrest — later was indicted with Leaming on a charge of retaliating against a federal judge or federal law enforcement officer. In addition to the charges of filing false liens, Leaming also faces charges of harboring two federal fugitives, being a felon in possession of firearms and uttering a bogus “Bonded Promissory Note” with a purported face value of $1 million. The U.S. Secret Service has described AdSurfDaily as a $110 million Ponzi scheme and a “criminal enterprise.” ASD President Andy Bowdoin is jailed in the District of Columbia, pending formal sentencing Aug. 29 in the ASD Ponzi case. One of the individuals against whom Leaming allegedly filed false liens is the Secret Service agent who led the ASD investigation. False liens also allegedly were filed against three federal prosecutors who worked on the ASD case and the federal judge who presided over it. Leaming has a prior federal felony conviction for piloting an aircraft without a license. So does this get laughed out of court or insta-dismissed without a hearing? Oz: So does this get laughed out of court or insta-dismissed without a hearing? First, nice to see you here, Oz. It’s hard to say how this will go because the “sovereigns” who end up in court generally don’t respect the authority of the courts and often retreat into an infinite set of contingencies to keep a “case” alive. Leaming’s history involves an ASD-related case filed in the U.S. Court of Federal claims. ASD figure Christian Oesch was a co-plaintiff in that “case,” which apparently sought the staggering sum of more than $29 trillion. The lifespan of that case in the courts before it got tossed was about six months. In general, the cases filed by “sovereign” prisoners get tossed for stating claims for which relief cannot be granted or for not meeting jurisdictional requirements. Even so, the docket sheets can expand as more and more “pleadings” pour in. It costs money and time. And there have been instances in which “sovereigns” have done things such as sue state judges in federal court, which causes the judges to have to hire a lawyer or otherwise make arrangements to “defend” themselves.